Dominic Coballe of N-Product wanted to do more with the shipping boxes that dropped into his office every week. Instead of consigning them to the recycling bin, the Canadian designer decided to turn them into jewelry. 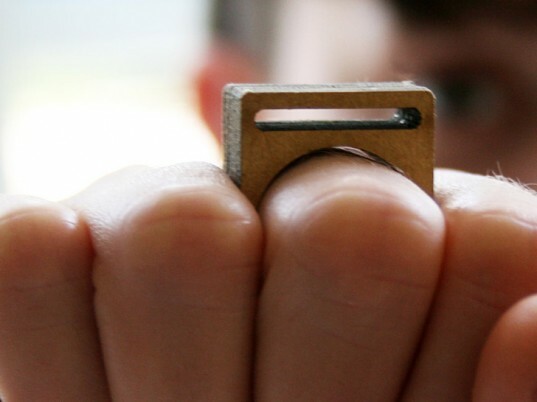 Together with Chrystale Ladouceur, his wife and partner, Coballe makes each laser-cut cardboard ring to order in the couple’s Ottawa workshop, home of the Deckster Re:Class series of iPod wristbands. Named for a Canadian singer, such as Leslie Feist, Kathleen Edwards, and Tegan and Sara, each ring consists of multiple layers of paperboard, glued together and lacquered with a polymer epoxy for water-, chemical-, and ultraviolet-resistance. “We are big upcyclers in our everyday lives,” Coballe tells Ecouterre. Dominic Coballe of N-Product wanted to do more with the shipping boxes that dropped into his office every week. Instead of consigning them to the recycling bin, the Canadian designer decided to turn them into jewelry. 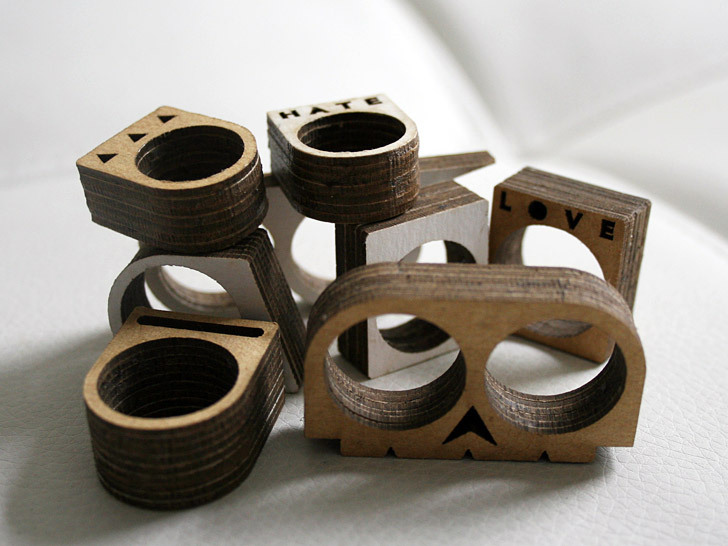 Together with Chrystale Ladouceur, his wife and partner, Coballe makes each laser-cut cardboard ring to order in the couple's Ottawa workshop, home of the Deckster Re:Class series of iPod wristbands.